Based on the famous Marvel Comics character of fictional superheroes, Fantastic Four is a 5-Reel 25-Payline slots game offered by Cryptologic. The games offer a fantastic value to players with five bonus rounds and three progressive jackpots. Play now at Intercasino. Fantastic Four is a beautifully designed game complete with all the characters from the comic book. The symbols contain all of Mr. Fantastic, Invisible Woman, Human Torch, The Thing and the famous Dr. Doom. There is also a Fantastic Four themed logo which is a Scatter symbol. There is a possibility of Multipliers which give additional payout. The other symbols are present there as regular feature. Justice has been done in designing these beautiful characters and complementing sound effects. When it comes to playing the Fantastic 4 slot online, we highly recommend Sky Vegas casino. The logos of any of the characters Mr. Fantastic, Invisible Woman, Human Torch, The Thing and Dr. Doom are present on different reels and can substitute for any of the winning combination. The wild symbols cannot replace the Scatter Symbol, Fantastic Four logo. The players get a chance to increase the payout beyond limits when three or more scatter symbols, the Fantastic Four logo, appears on the reels. The bonus feature gets activated offering the player an opportunity to free games based on the character selected. As with all the Marvel slots, Fantastic 4 has a great bonus round feature where the opportunity offered is to play 15 free spins, and all the winnings are doubled. Also, if Mr. Fantastic appears on Reel 1, it substitutes all the other symbols in a winning combination. 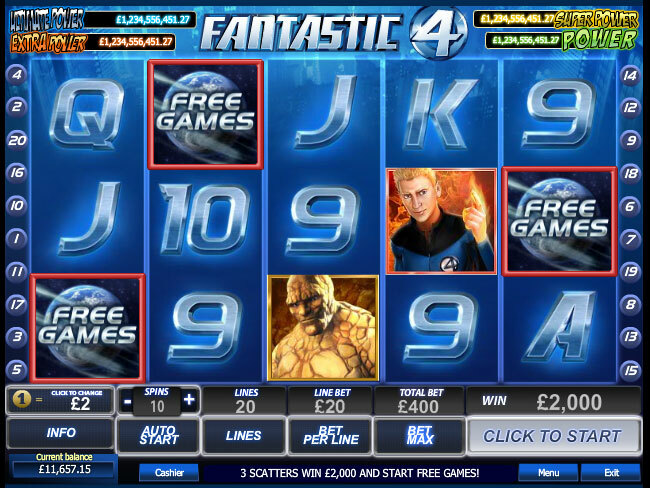 What makes Fantastic 4 such a great slot is this is just one of 4 bonus feature games! Human Torch Feature: The number of Free Games is 10 and all the winnings are tripled. Additionally, substitute symbols are added to all the reels during Free Spins. The Thing Feature: There are 15 free spins awarded. Along with all the free spins, the game generates its own multiplier randomly between 2 times to 10 times to give additional winnings. Mr. Doom Feature: The possibility of unlimited free games till the time Dr. Doom appears on Reel 5. All the winnings are tripled. The game offers three different jackpots to offer endless possibilities of winning. The three jackpots offered are a High Value Marvel Hero Jackpot, a Super Hero Jackpot and a comparatively lower but more possibility of a Hero Jackpot. The best part about the Jackpots is that the player does not really need to win on the reels to win the Jackpot, they are offered randomly. The more the player bets, the better the chance to win a higher value Jackpot. Intercasino featuring Fantastic 4 and all the Marvel Slots, Intercasino comes highly recommended. Sky Vegas online casino has over 100 bonus slots including the Fantastic 4 Slot.